Exams week is here!!! And surprisingly enough I don't feel nervous or stressed about it like I usually am when exams are on. Probably because I'm too excited about my Turkish trip which is this Sunday btw, and also probably because I'm not in the momentum of exams so I don't care if I screw my Add maths or Bio for this term. And I'm not even counted for class positions since I'm not sitting for all the exams. So....Bio what??? Some of friends and I celebrated Daryl's birthday today. Well, more of his belated birthday since it was actually yesterday. Bought him a chocolate walnut cake from Secret Recipe and sang him a birthday song in the canteen during reccess. It was Daryl's first surprise cake, I think and he seemed very happy about it. Good thing. So HAPPY 16TH BIRTHDAY, DARYL!! 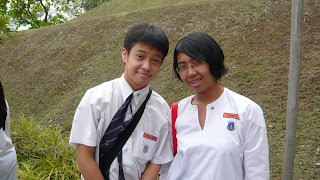 This was the guy who taught me how to do Locus, Geometry and all the Maths nonsense prior to PMR until I understood. This was the guy who gave me a book on time management, a candle and a card as a way of him saying sorry. This was the guy who I spent tons of time together on debates be it the class or school debates. And thank you Daryl for the friendship that you offered and still offering me. May God bless! And all the best to the rest of us who have to endure the pain of sitting on chairs for hours cracking our brains for answers.